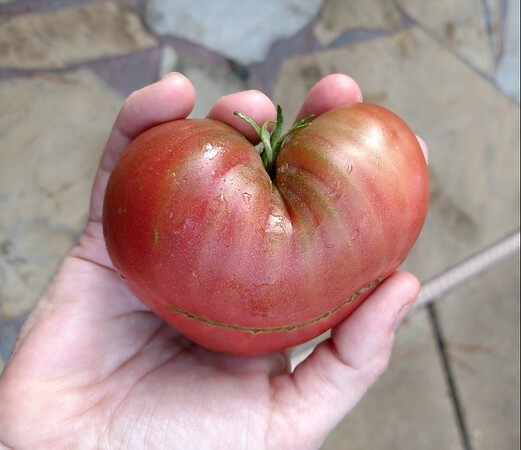 EDIT: I have been informed that this is not a kidney, but a heart. This entry was originally posted at https://laridian.dreamwidth.org/2899752.html. Please comment there using OpenID. That must make slicing pretty interesting. We're mostly eating these as wedges or pieces "as is", maybe with a little salt, rather than sliced for sandwiches like the round ones. 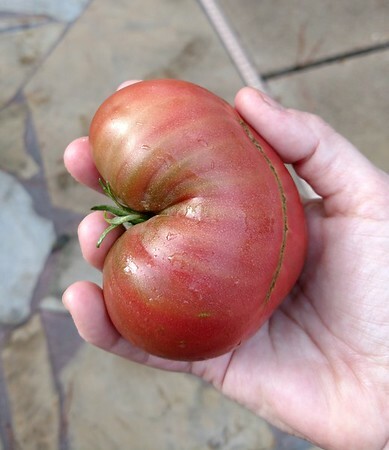 But a lot of heirloom tomatoes are apparently like this, oddly shaped etc. Not bred to be round. I have to say they taste way better than the bright red, round hybrid I'm also growing. Those are OK, not gonna lie, but the Cherokees taste so much better.